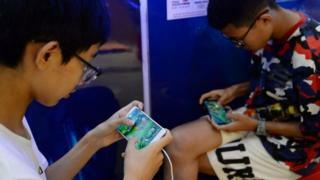 Following the criticism, Tencent took the decision to restrict the time children could play it - with children under 12 limited to one hour a day and those between 13 and 18 to two hours. The new system will help it more accurately identify young players and "better guide under-aged players to game sensibly", the company said in a statement on its official WeChat account. Chinese President Xi Jinping has spoken about the need to address the problem of gaming addiction, in particular voicing concerns about how it may be affecting children's eyesight. Following his comments, China's Ministry of Education announced that it would curb the number of new online games available to children and take new measures to limit their time on games.